Why? Because it opens a new door to mass spectral data. 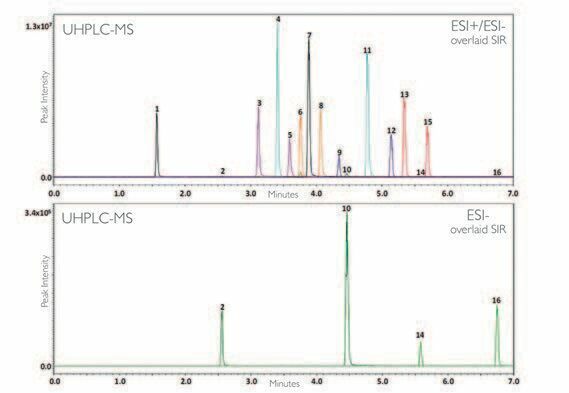 Guillarme – a chromatography specialist – explains why simple but robust mass detection has found an important role in method development in his world: pharmaceutical analysis. What are your analytical goals? My field of expertise is liquid chromatography (LC), supercritical fluid chromatography (SFC) and their hyphenation with several detectors, including UV, UV-DAD, ELSD, fluorescence, MS, MS/MS and high-resolution (HR)MS. Our laboratory is particularly interested in investigating modern LC and SFC technologies; for example, the use of advanced columns (sub-2-μm porous particles or sub-3-μm superficially porous particles) in conjunction with chromatographic systems at very high pressures. Our overarching goal is to develop ultra-fast and/or very high-resolution separations for pharmaceutical samples of varying levels of complexity – and that means the analysis of small and very large molecules in simple pharmaceutical formulations, but also in biological fluids (using suitable sample preparation). What are the analytical challenges your lab faces? The cost (both in terms of initial purchase and ongoing maintenance). Another challenge, which emphasizes the rapid development in mass spectrometry, is the fact that MS systems can become obsolete after only a few years. New models are released so regularly that it’s difficult to stay at the cutting edge when it comes to sensitivity in a given application. What MS systems do you have at your disposal? We have several MS systems from different manufacturers, including two single quadrupoles, two triple quadrupoles, one Tof-MS, one QTof-MS and one Orbitrap. Depending on the application (targeted or untargeted) and the required sensitivity, we have the ability to hyphenate different inlet instruments (capillary electrophoresis, LC or SFC) to these MS platforms. What motivated you seek other solutions? The MS systems in our laboratory are somewhat expensive to operate and not always convenient or easy to use, which means they tend to be devoted to projects that deal with the analysis of complex matrices (for example, urine, blood, plasma, cerebrospinal fluid, and plant extracts). The significant operating costs (and the high demand for the MS instruments) have prevented us from using mass spectrometry to speed up method development in chromatography – even though it’s known to be a very powerful tool. Over the last few years, we have used various commercial software packages, including a peak match tool, for peak tracking based on UV absorbance, for successful HPLC method development. However, based on our experience, we believed that the method development process could be faster and that the confidence in our results would be increased with the help of mass detection. To that end, the launch of the QDa – a simple, relatively sensitive, low-cost mass detector, which was compatible with our Empower chromatographic software – caught my eye. Notably, high-powered MS instruments are not always needed. Sometimes, a very simple mass detector can have a real impact in the laboratory when it comes to method development, which is now one of the main roles of our QDa instrument. How does ACQUITY QDa fit into your current workflows? The analysis of small molecular weight compounds in relatively simple matrixes – especially when UV sensitivity is not sufficient or compounds do not possess chromophores. In our UHPLC-UV-QDa set-up, a dilution pump with a splitter is included between the UV and QDa detectors to attain concentration levels that are compatible with both detectors. In general, the QDa is around 100 times more sensitive than a UV detector (though this factor strongly depends on the chemical nature of the analyzed compounds); by using this setup, the signal of both detectors can be recorded at the same time. Mass detection is extremely useful in analytical chemistry and will certainly continue to develop at a rapid pace., says Davy Guillarme, Univ. of Geneva. How would you assess the QDa from a laboratory management standpoint? From an economic point of view, the QDa is extremely attractive, as the purchase and operating costs are significantly lower than any other MS instrument on the market. In terms of lab efficiency, the QDa is extremely easy to use and controlled by Empower – a widely used chromatographic package, which means that technicians and interns can be trained to use the QDa in less than one day! In my opinion, the simplicity of the QDa is comparable with spectroscopic detectors, so can even be used by people with very limited MS backgrounds. Thanks to these positive features, we are now able to use mass detection for more applications, improving confidence in our results and increasing the amount of information that can be gained from a single injection. Bench space in most laboratories is at a premium – but because the QDa is fully integrated with the UHPLC instrument, it doesn’t take up additional space. Another surprising advantage of the QDa mass detector has to do with comfort. The primary pumps of other MS instruments are noisy and typically run 24/7, making laboratory environments tiring. The QDa (and its primary pump) can easily be switched off when not in use, which is a clear advantage. After turning the instrument on, only a few minutes are needed before the system can analyze samples. And because the primary pump is much smaller than other MS devices, the noise remains reasonable even when the QDa is in use. Will robust, simplified systems change how mass detection is adopted? Many laboratories could benefit from the excellent sensitivity, high selectivity and mass information provided by mass spectrometry, which perfectly complements chromatographic methods. However, as noted above, such MS instruments are not always available, either because of the associated cost or a lack of highly qualified technicians. The QDa changes the rules. It has been specifically designed for chromatographers and not for mass spectroscopists – and it makes mass detection much more affordable. Where do you see the future of mass detection in your field? Mass detection is extremely useful in analytical chemistry and will certainly continue to develop at a rapid pace. I see two different trends in the MS market. On the one hand, many providers will continue to offer MS instruments with increasingly high performance; such state-of-the-art instruments are obviously dedicated to mass spectroscopists, with specific training and expertise. For this category of instruments, I suspect that IMS-MS will be more and more widely used in the future. On the other hand, there is a clear drive towards making mass data more accessible to non-mass spectroscopists (for example, chromatographers). Here, lower cost, simplified operation, reduced size, and reduced maintenance are the most important factors. In the future, I expect – and would like to see – other types of mass analyzer enter into this second category, including triple quadrupole and time-of-flight instruments.